Employees who are encouraged to take pride in how their place of work appears will be more engaged and productive in their jobs. 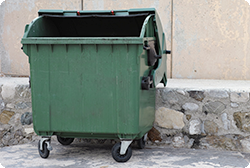 Keeping the exterior dumpster area clean helps you maintain a business that is welcomed in the community. This computer-based training module outlines employee responsibilities for keeping trash areas clean and tidy. Employees learn to properly dispose of trash and recyclables and how to clean the dumpster area to discourage rodents.